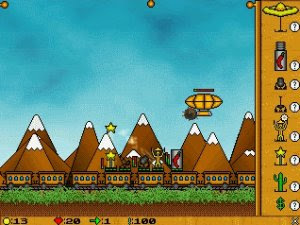 Railroad Rampage is a cross between an arcade game and a strategy game. It is similar in construction to many "Tower Defence" games, but it has a twist: here, you are part of the action and can affect the game in many different ways more than just building structures. Bandits are trying to rob your train and steal all precious cargo! Thankfully, you are a skilled engineer who can construct many different kinds of turrets and use them to defend your train. You have to make it through 20 waves of relentless enemy assault before you reach your destination, so plan ahead and devise a smart strategy and you may survive! The Wiz version of Railroad Rampage won first place in the GP32Spain Tower Defence Contest!